If there are two things in this world that everybody loves it’s eating ice-cream and play slots online, the two are synonymous with joy and well-being across the world. For any of you who are unaware, a ‘99’ is an ice-cream that costs 99 pence. This 5 reel slot game will have you hankering for the summer months as you spin through reels filled with ice-cream cones, ice trucks and huge amounts of free spin bonuses. This game is designed and developed by EyeCon, an Australian company that delivers great titles to the casino gaming market since 1997. Games like 99 Time is what made them famous in the digital gaming sector, with over 100 titles in their portfolio, all of them being designed for entertainment, with stunning graphics and top-notch gameplay and animations. Getting you to enjoy every single spin is their main focus, as this game-development company has invested a lot in highly-skilled professionals specialized in 2D and 3D graphic design. Don’t just take our words for granted, have a try yourself! Get in the game and enjoy the winning feeling in an astonishing atmosphere with 99 Time slots game from EyeCon. If you like EyeCon game click here to see more. Who doesn’t like sitting on a sunbed, by the seaside, watching the waves, having a delicious ice-cream and not to have anything to worry about? Well, get your worries aside, and live the good life on the Riviera as you are in for a delicious treat with 99 Time slots game by EyeCon. Is anything comparable to the feeling of hearing the ice-cream van coming to your street on a hot summer day? Yes it is, the winning feeling you get on this game is just like having a mouth-watering scoop of vanilla ice-cream with a monkey-tail on top. Get a trip to the seaside and enjoy watching the waves and catching a tan, with the beach-themed background of this game, that is designed for you to thrive for one of the deliciously looking ice-creams cones and wafers that you can get by spinning the 5 reels. 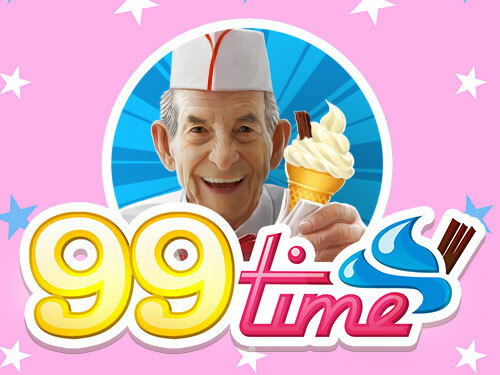 From a huge variety of ice-cream van goodies, the most delicious one to get would be the Mr. Whippy-style 99 – if you are lucky enough to settle on 5 of these, completed with a flake, you’ll whoopingly win 200x times your stake. Getting your mouth watering yet? Well, we have more for you, wilds, scatters and free spins are also features for you to enjoy this amazing game. The Ice-Cream van symbol is the wild that substitutes but the scatter and doubles the payouts of every winning pay-line you get. 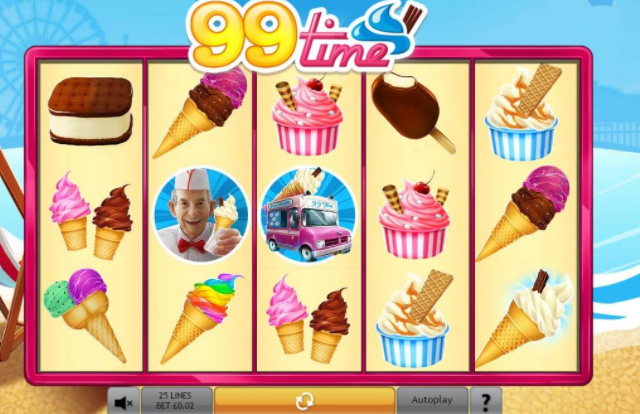 Speaking of winning, you also get yourself up to 25x free spins if you land on more than 3 ice cream van symbols. You can make it yourself! Get behind the ice-cream bar, and be the goodies maker to earn amazing prizes. Land 3 or more of the Ice-Cream Man scatter and let your creativity lose trying to make a delicious ice-cream, picking from a large variety of wafers, cones, sprinkles, fruits, and flakes. Each of them has amazing prizes for you, up to 100x times your stake, if you make things right. We know you can! So go on having delicious prizes with 99Time slot machine from EyeCon! With this fun-to-play, entertaining and astonishingly-looking game from EyeCon, we can guarantee that you will have a smashing time. You’ll enjoy spinning and winning on the seaside, with this ice-cream/beach-themed slots game, that delivers a serene and enjoyable atmosphere for you relax in. 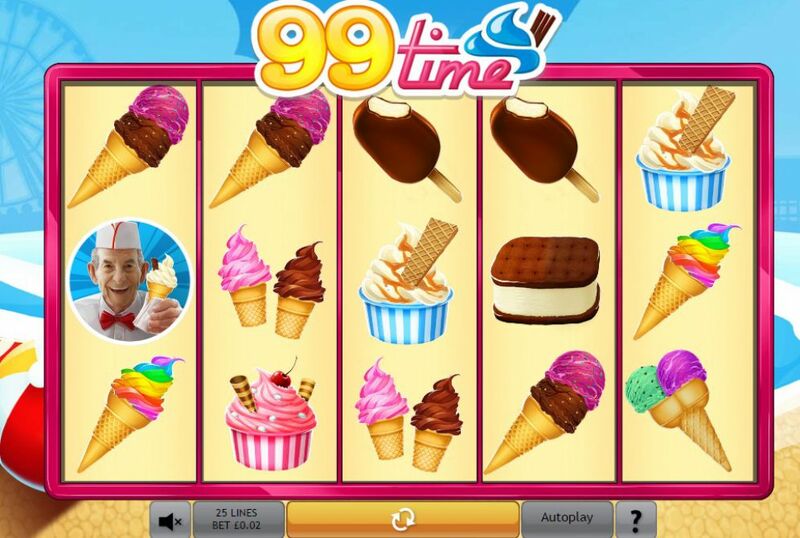 We know you love having an ice-cream on a sunny day at the beach, so why won’t you get on a trip and win amazing prizes with 99 Time slots game.Now check out our Super Cash Buster slot and to discover more Easy slot games Click here.